I originally wrote this while I was reading “Do Over” by Jon Acuff. It was in response to the Day 5 assignment. Good to know that three years later that I am consistent about not posting consistently – even drafts. Where is the most motivating place you’ve ever visited? Refresh!!! I find myself at a loss for words when I attempt to describe Refresh Summit ’14 in fewer than four sentences. I’ve been struggling to blog post about it for almost a year now. Mainly because I keep writing too much. Like an epistle too much. Seriously, I could write a blog series about the two days I spent in a B&B cabin with 39 other women in the mountains of Tennessee. I would describe it as “overnight camp” for women. I never got to go to away camp and it was everything I imagined summer camp would be like. S’mores and all. Except there were no crazy antics involving paddling to the boys’ side of the lake or weird girl clique issues. Obviously, all of the camp ideas I had was based on the 1980’s movies I watched growing up. Even without all the cheesiness of an 80’s movie, I got all of the things I wanted out of an away camp experience at Refresh. And a lot that I didn’t know I could get out worshipping God, fellowshipping, exercising, and eating really good food. What I can say succinctly about Refresh is that it’s the most uplifting and motivating experience I’ve had in the last several years. 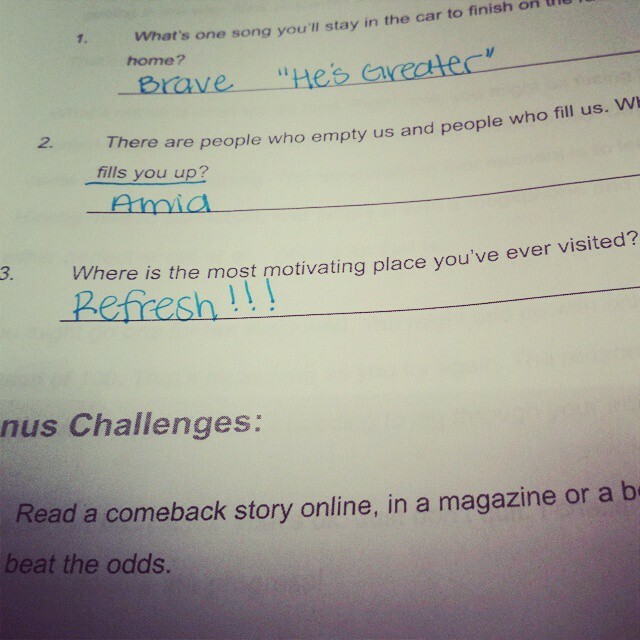 Where’s the most motivating place you’ve ever visited? Want to attend Refresh Summit South 2018? Registration is now open! Primos!!! . The twins met my nephew for the first time. And they're absolutely smitten. While DJ doesn't look super excited - he ate way too much sushi 🍣🍣🍣😄 - he loved getting to make beats with Anthony after dinner. . I ❤️❤️❤️ familia!!! Verse of the Day - Day 106 . "He humbled himself in obedience to God and died a criminal’s death on a cross." Philippians 2:8 NLT . And I wanna complain about writing a blog post I think might could possibly make people not like me. 🤦🏽‍♀️ Lord, forgive my disobedience. I believe (trust), but help my unbelief. My local Vitamin Shoppe is to me what Cheers was to Norm. No lie. I don't come in as often as I once did, but I'm always welcomed with a HEY! and usually by my name. . I was so excited when I was asked during the checkout process if I'd like some of my total to be paid for me. Honestly, I was a bit confused and thought I misheard the question 😄. Once I computed what was up I said "Uhm, yes, please, and thank you!" I am a daughter of God – a rebellious sinner saved by grace. I’m a full time wife, mom, a high school math teacher, and a certified Revelation Wellness® instructor. I also dabble a bit in blogging. Faith Fitness and Mommy Stuff Blog at WordPress.com.